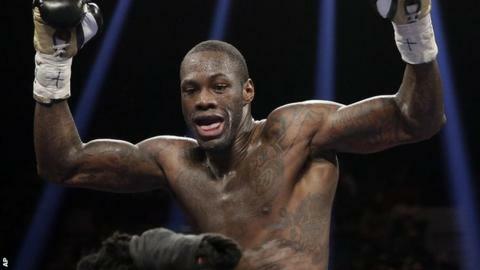 Talks over a possible heavyweight fight between new WBC champion Deontay Wilder and Briton Tyson Fury have taken place, according to promoter Frank Warren. The US boxer, 29, scored a points win over Bermane Stiverne last weekend and stated his intent to take on Wladimir Klitschko but also name-checked Fury. European champion Fury is set to meet Christian Hammer on 28 February, but said that fight could be dropped. "If we made that fight today I would pay Hammer off," said Warren. He added: "I had a conversation last night with the Wilder's team but it is early days. They said they wanted it - they called it out. "We would pay Hammer, give him another fight on the card and go straight to the Wilder fight, why take the risk?" Fury is the mandatory challenger for Klitschko's WBO title after his win over fellow Briton Dereck Chisora last year. But the Wilmslow-based 26-year-old said he was concentrating on his next bout, which is scheduled to be against the German, Hammer. "It is very refreshing to hear the new heavyweight champion wants to fight me," Fury said of Wilder. "It shows the calibre of fighter I am when the first thing out of their mouth is that they want to fight me. "[But] I must focus on this fight and I take it very, very seriously. Hammer is a good boxer."